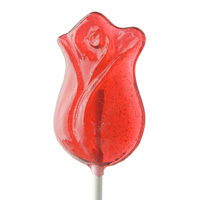 This classic heart lollipop has been updated with creamy vegan "milk" chocolate. Wrapped in red foil, the chocolate says "To my Valentine". Ingredients: Vegan "milk" chocolate (organic evaporated cane juice, organic rice milk powder, organic cocoa butter, organic cocoa paste, organic almond milk, organic vanilla). From the package: Shares equipment with peanuts/tree nuts, may contain trace amounts of dairy protein. Each 1.25 oz/35g heart is approximately 2.5"x2.5" (7 inches total with the stick). Vegan milk chocolate made with natural ingredients will taste different than the typical brand name waxy chocolate that those of us in the USA are accustomed to. If your palate is only used to common chocolates, you might not care for the natural vegan stuff. However if you let yourself taste this for what it is (don't expect it to be a perfect match for "regular" or gourmet chocolate, I think you will be pleasantly surprised. This is one of the best vegan milk chocolates I have tried. I love these vegan chocolates! They were just what I have been missing in milk chocolate! I recently got this for my 5 yo daughter for Valentine's Day. While she loved the packaging when she opened it to eat it she handed it to me and said I could have it. When I took a bite I had to admit it wasn't very good. I would not recommend.